Product prices and availability are accurate as of 2019-04-11 10:15:17 EDT and are subject to change. Any price and availability information displayed on http://www.amazon.com/ at the time of purchase will apply to the purchase of this product. The little-known yet fascinating story of when two of the most iconic aircraft of World War II dueled in the skies above Australia. Fully illustrated with detailed full-color artwork, this is the gripping story of two iconic aircraft facing off against each other above Australia. 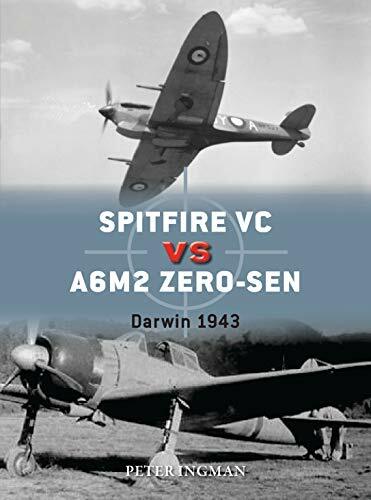 A year later the Spitfire VC-equipped No 1 Fighter Wing, RAAF, faced the battle-hardened 202nd Kokutai of the IJNAF, equipped with A6M2 Zero-sens, over Darwin. This was a grueling campaign between evenly matched foes, fought in isolation from the main South Pacific battlegrounds. Pilots on either side had significant combat experience, including a number of Battle of Britain veterans. The Spitfire had superior flight characteristics but was hampered by short range and material defects in the tropical conditions, while the Japanese employed better tactics and combat doctrine inflicting serious losses on overconfident the Commonwealth forces.